This goes down really well during the hot summer months! Macedonia is simply a fruit salad, usually dressed with lemon juice, honey and a little zest. I thought a little alcohol and poppy seeds would make this dressing more interesting. 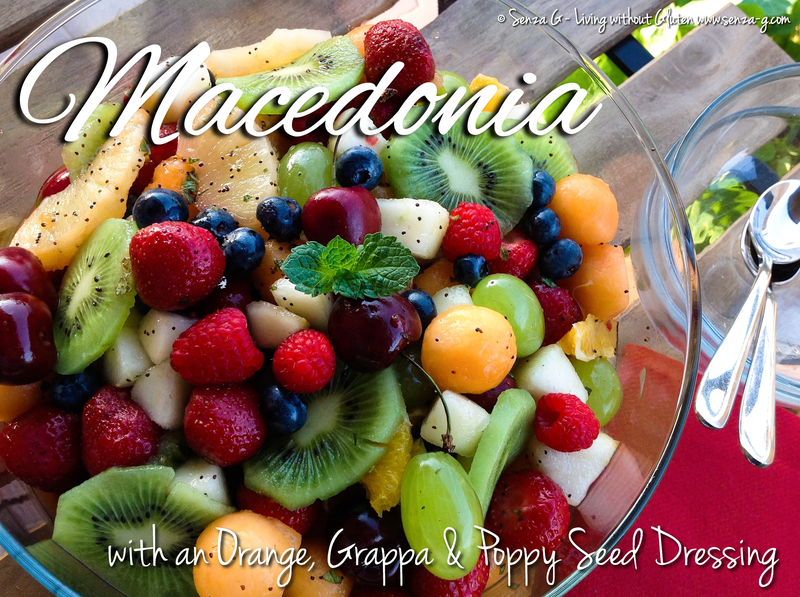 You can really use any combination of fruits for this Macedonia. I myself have used cantaloupe, strawberries, blueberries, raspberries, kiwifruit, pineapple, pears and cherries. Wash all the fruit and drain. Peel the pears and chop. Slice the cantaloupe and using a melon baller, scoop out little balls. Hull the strawberries. Remove stem from cherries. Peel and slice the kiwi. I used canned pineapple slices. Put all the fruit ingredients in a large bowl, add the dressing and toss gently to combine. Cover and chill for about 2 hours. The longer it marinades in that dressing, the tastier it will be! It is also lovely served with a scoop of vanilla ice cream!